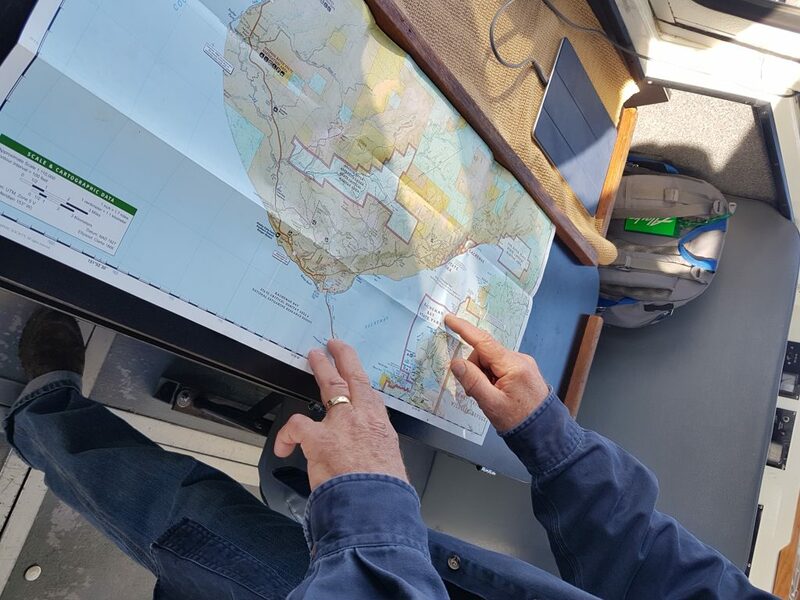 Seaman’s EcoTour Adventures captain Glenn Seaman revved the outboards of his boat The Pinbone with enough oomph to jostle my still-dozing teenager from his early-morning reverie. 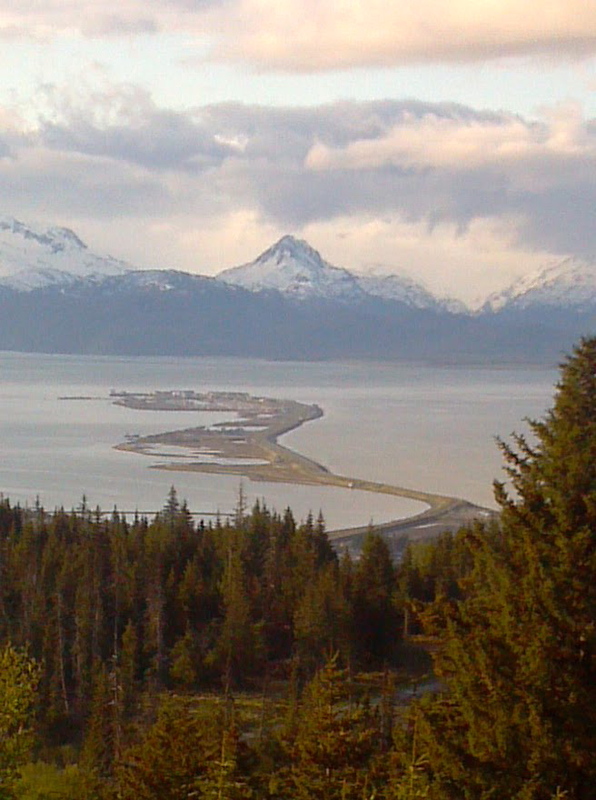 It was 8 a.m. and we were headed out to explore Kachemak Bay, a 40-mile long arm of the Kenai Peninsula’s southwest side. “Ready, everybody?” Seaman asked as he eased the vessel carefully around the harbor. We cruised through the no-wake zone, motors softly purring now, sun shining into the cabin, out toward the blue water of Homer’s Kachemak Bay. We were on our way to a day of salty seagoing adventuring, all right, and as the boat turned left toward the calmer waters of the eastern end, I took a deep breath. This was going to be good for all of us. 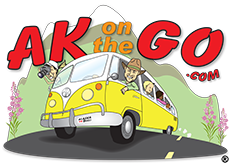 It’s tough for Alaska visitors to choose a day tour of any length, but doubly so when trying to navigate the details with children. 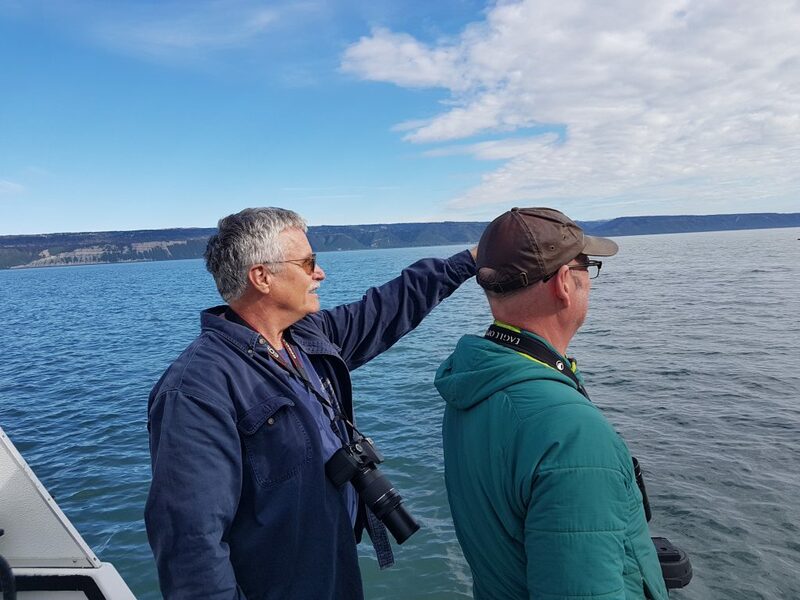 The usual, larger-company tours are pretty standard in the fun department; whales, the occasional bear, bald eagles, pretty scenery — you know, the stuff grownups love to oooh and ahhhh over as they snap photos for Instagram. Kids go along for the ride with Junior Ranger books and binoculars, and have a great day, to be sure. It’s just that we’ve done that, so when Captain Glenn shared the virtues of his tours during a quick trip to Homer last winter, I bit. We booked a trip that fortunately dawned on a delightful day, trundling our packs and snacks down a steep ramp to the Seamans’ EcoTour Adventures slip in the Homer small boat harbor. Seaman had already inquired as to our personal preferences for the day’s trip, and about our son, so he knew everyone’s name, background, and even experience in the Alaska outdoors. How perfect. The Pinbone scooted to the east bay, Seaman slowing several times for rafts of otters bobbing in the wake, heads up, curiously watching us go by. 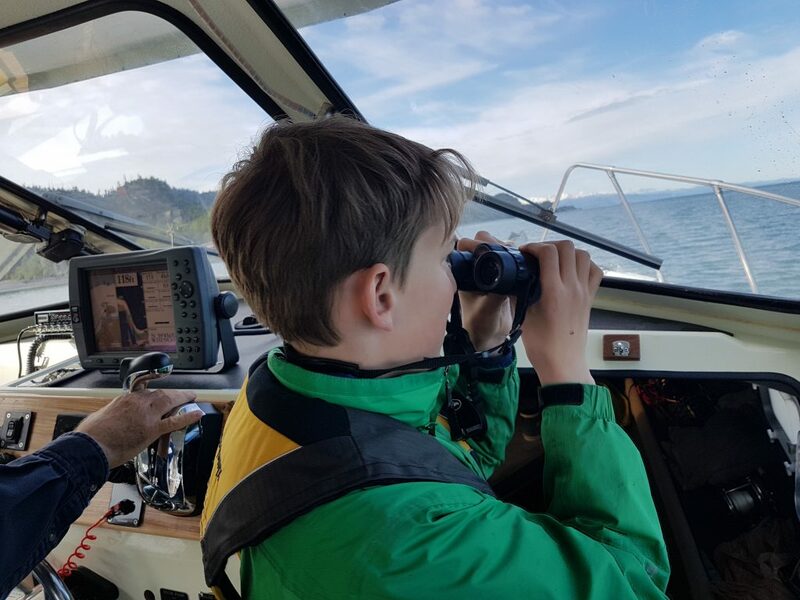 Our son received a quick lesson in the otters’ history and relevance to Alaska Native culture as we traveled on, since Seaman is a longtime naturalist and research expert in the realm of coastal Alaska. Even to the adults’ semi-polished knowledge banks, this information was new and refreshingly different from how it had been presented in previous situations. We ambled our way around the fringes of Kachemak Bay State Park, spotting a bear doing the same on the shore, then watched a group of kayakers and hikers head toward the trails of Grewingk Glacier and Grace Ridge. Seaman offers hikes to these places in addition to boat tours, too, and can tailor a day specifically arranged for a group’s activity level and interest. A highlight of the experience was a stop at Halibut Cove, famous for its quirky community and a rocky, grassy landscape reminiscent of something out of Ann of Green Gables. Seaman moored the boat and led us across the dock and up into the inner reaches of this delightful space. A small herd of horses grazed in the breezy sunshine, boats came and went into the cove, and small wildflowers nobly bloomed along the pathway. The message here is, of course, to sometimes take the boat less traveled in order to become immersed in the backstory of Alaska that doesn’t always get told. We didn’t need the usual; we needed the unusual, and an opportunity to come away with new information about familiar places. As Alaskans, we often think we know everything, but a day with Glenn taught us just how much more to this glorious coastal world there actually was. Glenn Seaman is a wealth of knowledge and is an excellent teacher of both children and adults. Did a bit into his tours before booking, and expect him to ask what you’d like to see. It’s highly likely he’ll help you find it. Trips range from $450/half day to $850/full day, depending upon the number of passengers and your willingness to share The Pinbone with other visitors. Dress for all kinds of weather and chilly temperatures on the boat regardless of sun, rain, or something in between. It’s breezy on Kachemak Bay. Seaman offers snacks and a beverage or two for his passengers, a truly thoughtful touch after a day of roaming around working up an appetite. Bring binoculars, a camera, and expect to give them both a workout. Don’t be hesitant to call Glenn – ask questions. He lives for conversation with guests (and it makes a difference in the overall experience). 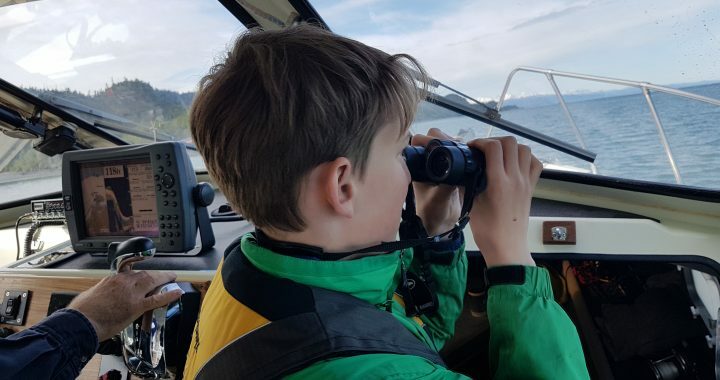 Posted in Kenai Peninsula, Wildlife/Glacier cruising and tagged Alaska with Kids, boating Alaska, day tours, Family Travel, Homer, Kachemak Bay State Park, Kenai Peninsula, Seaman's EcoTour Adventures.